Welcome back to Sam’s Corner for the most magical time of the year! Are you decorating your homes and shopping for just the right gifts like we are? 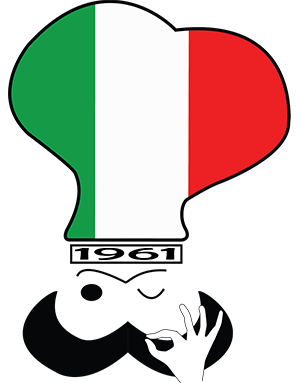 Sam’s Italian Market first opened our doors in Willow Grove on December 15, 1977 and we’ve been helping our neighbors have Happy Holidays ever since. This will be our 41st year in our current location. When preparing your Christmas Eve celebration, we have your seven fish and much more. Sam’s has all your favorites: Smelts, Baccala (dry cod), Shrimp, Squid, Calamari, Crab, Clams and our famous Baccala salad. Sam’s wife Martha brought the Baccala recipe from Calabria, Italy to the US and we still prepare it the same way: We soak the Baccala in water for a few days, then added fresh vegetables, olive oil, and salt. Simple ingredients that have endless amounts of flavor! The center plate of almost everyone’s holiday meal? Meat. Sam’s only offers U.S.D.A. Choice meat. 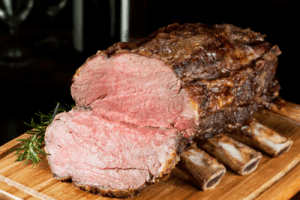 Whether your family prefers a bone in rib roast, porchetta pork roast, ham, or something different, we have you covered. The last day to order our meats in time for Christmas Eve dinner is Sunday, December 16. Place your orders over the phone or come in, say hello, and order at the deli counter. Of course, we will also have hearty party trays for any Holiday celebration – including lasagna, chicken marsala, or arancini (our mouthwatering rice croquettes) to enjoy! And usually last but definitely never least, desserts! Sam’s bakery will be in full swing and baking around the clock to make sure you will have our famous bread, rolls, tomato pie, or pastries for your special feast. 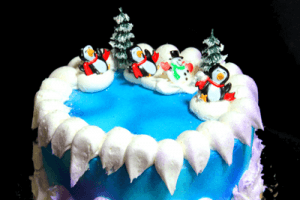 You might be interested in ordering our famous Winter Wonderland Cake or the always crowd-pleasing cannoli dip tray. Of course, we have torrone (Italian nougat) – a holiday would not be right without it! And, we would be remiss if we didn’t tell you about our very special Christmas panettone this year, which is a creative collaboration between Dolce and Gabbana (yes *the* Dolce and Gabbana) and Fiascanaro, Sicily’s premiere confectionary. 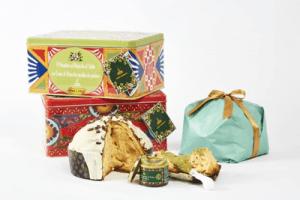 One is made with pistachio and comes with a jar of pistachio cream and a knife with which to spread it and one is their take on the traditional panettone. Both are ridiculously rich and oh so yummy. Sandwich of the Month: December’s spotlight sandwich is our Chicken Cutlet Hoagie. This is the same recipe that Sam’s wife Martha makes in her very own kitchen: we hand cut chicken, dredge it in whole eggs and then dip it in a mix of pecorino cheese, parsley, breadcrumbs (from bread made in our bakery) and then fry it. Is your mouth watering yet? Let Sam’s help you take some of the pressure off so you can spend more time the ones you love and less time working in the kitchen. We wish you and yours a very warm and wonderful holiday season. Buon Natale!!! And the best all the best in 2019 from Sam’s Corner!